If you love fishing you don’t need to go anywhere else, when you can easily afford a remote control fishing boat having a length of 19” for $50 . By having this creative fishing boat, you can fish in any area around with the help of its remote control. 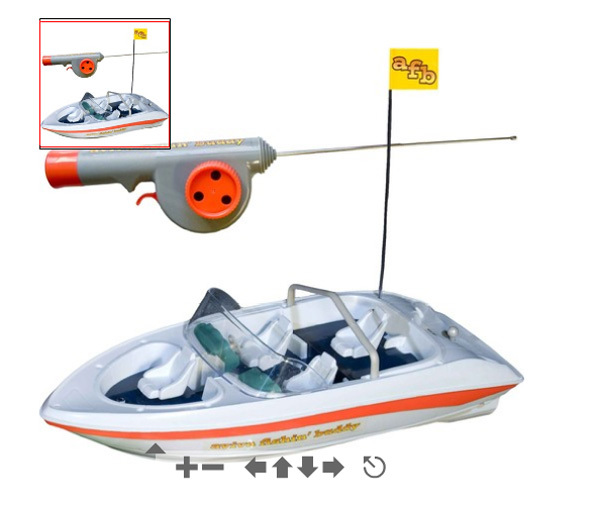 The remote controlled fishing boat comes with a plethora of useful tools like two bobblers, two hooks, two fishing lines, and a retrieval hook which is extendable up to 41”. You can also purchase hooks, lines, and bobblers as an extra accessory pack. If you are a resident of Florida, you will have to pay the sales tax on this purchase. The fishing boat comes with a 9-volt battery, which is rechargeable. The remote control reach could be around a distance of 50 feet. The boat has the ability to catch fishes of about 3 pounds and its direction is controlled by the knob. On having a simple glimpse at this remote control fishing boat, one can hardly imagine that this product could do wonders, the boat looks robust and has a classic design. The fishing boat has the capability to operate at one of two speeds or contain a continuum of speed. A built-in control system allows control of the direction of movement and the speed of the boat. A line cutter positioned in the boat helps the fishing line pass through the line cutter. For some reasons, if the fishing lines come across problems, the line cutter would be able to control the system to sever the line and free the boat, when it is activated. The fishing boat is controlled with the assistance of an electronic knob held by the angler and receiver mounted on the boat. The boat carries a guarantee of one year. It will be great if the manufacturers of this remote control boat can make it somewhat bigger to accommodate people, who can go fishing on a leisure trip. You may like to look at other great fun toys, check out The Award Winning Fuel Cell Experiment Car and The Mob Sports Car – Made From Liquid Wood!. © 2019 Gadget Him. Inspired by users. Powered by Wordpress. Proudly Hosted by (mt) Media Temple.